On July 14, 2016, I did a post about the upcoming problem of the amount of trash becoming greater than the population of fish with the current rate of disposed trash in the ocean. Cleaning up is one way, but what to do with it? 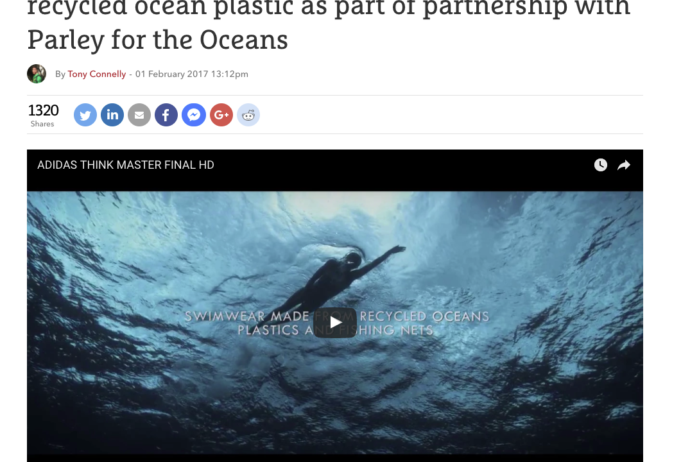 Well recently, Adidas partnered up with Parley for Oceans to save marine life and clean water by creating swimwear range made from recycled ocean plastic, such as fishing nets. This reminds me of a conversation that my dad and I had over the Christmas break while running at my grandma’s house in Colorado Springs. We discussed using old t-shirts for building the backpacks. My dad knows someone that has a business of taking someone’s old t-shirts and creating underwear for them (Kori Jock – La Vie en Orange). We can possibly do that with one of the designs of the Pick’n Run backpacks. If you want to read on about the partnership between Adidas and Parley for Oceans, and their swimwear products, click on the link.